Staffing your library, sharing library hours, hosting events, and allowing patrons to book library spaces and equipment are essential to library success. Unfortunately, managing all of these can take a lot of time. Join us as we show you how to set up and streamline the process in LibCal and LibStaffer. Whether you are new to LibCal or LibStaffer, or have had it for a while, we'll help you maximize its potential. 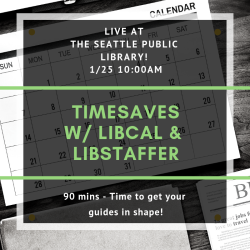 We will take an in-depth look at all of the features LibCal and LibStaffer have to offer to help you save time. Lend out equipment and even charge for it! And of course, generate stats to share with staff and admins.